Now, play from your rightmost or second-rightmost hole. Either of these moves will drop a stone into your opponent's third hole blocking him to make the same opening move. Try to make moves that will maximize the number of stones going into your Mancala. When stones go into your Mancala they cannot be taken out again with subsequent moves and you score points with it. In each turn, your first move should always allow you to move again. So, your last seeding stone must land in your own Mancala. But watch out, this may not always be the best strategy because it will empty your side of the board too quickly. A technique I often use is to empty my rightmost hole as early as possible in the game. Then whenever I get a pebble in it, I play that pebble into the mancala on my immediate next move, whether as part of the current turn or the next. 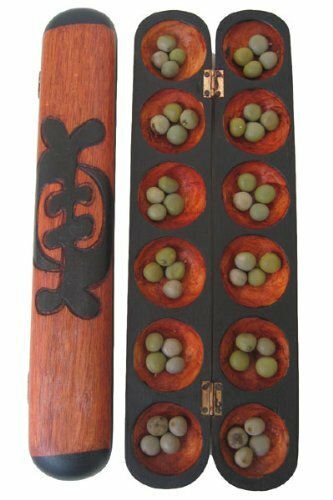 This not only accelerates the accumulation in the mancala, but it also avoids having to pass pebbles over to the opponent if more than one pebble accumulates in the rightmost hole. If you can't make a move where your last stone lands in your mancala, you should always aim to capture the stones on the opponent's side of the board. If you can't capture opponent's stones, then make a move on your turn that prevents your pieces from being captured by moving stones into the opponent's empty pit. This will not maximize stones going into your own mancala, but it can stop your opponent from capturing your stones. 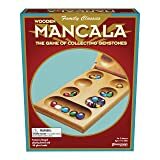 You should also try to remove the opponent's ability to move more than once during his turn by dropping a stone in the hole that would have allowed your opponent to end his turn in his mancala. Create empty holes on your side of the board where your opponent's hole is not empty in order to capture his/her stones. Empty your rightmost hole already early in the game as this is directly next to your mancala zone. Whenever you pick up a single stone from that hole as your move, you will score a point and get another move. Your next move should be to drop stones into your mancala for another free point and then move again. The biggest key to win Mancala is planning ahead. It is kind of like chess--the key is knowing what you will do a few moves in advance depending on your opponent's move. Understand that timing is crucial in this game. But also watch out your back for captures of your opponent. If one of your holes filled with stones is threatened, your next move could either be to fill the empty hole or play the stones from your full hole as a defensive move. Keep the number of stones in each bin less than or equal to the number needed to hit my own mancala. This allows you to starve your opponent, but it gives you also a board position that offers you a variety of different strategies depending on the moves your opponent. Sometimes, it's good that some of your stones are being raided. This occurs when the future cost for your opponent is higher than the stones he was able to capture. Always weigh the costs against alternative moves and simultaneous benefits. Hoarding is placing several pebbles in one hole and having it act like a little store. This serves two possible purposes: it keeps more stones on your side so that when the game ends, you get to capture all those stones. It also limits the number of pebbles your opponent has to work with.